You have to feel it’s a good time for shoes. In the past year we have seen the launch of Anthony Cleverley, Top Drawer from Edward Green and now Deco from Gaziano & Girling. All superlative ranges of shoes, sold on their craft and priced over £1000. The market is in accord: men now value the handcraft that goes into a pair of English shoes so much that they are willing to pay twice the previous standard for high-end footwear. Around half the price of bespoke, and they aren’t even made bespoke – made to order, for sure, but without the fitting and individual last that stands bespoke clothing apart. These aspects of aesthetics are now considered extremely important: a bevelled waist, with the upper cut very close to the sole, by hand, to create a rounded, enveloping effect on the arch; heels that are pitched forward in line with the heel cup, or narrowed, so that they continue the line of that slim waist; and extra hand finishing on the upper, to echo the look of an old, bespoke pair of favourites. This trend is great news for the industry, for the continuation of craft and for us, the consumers. It also proves wrong one long-held theory of mine regarding the difference between bespoke shoes and bespoke suits. For while both excel in their long-term value and level of craft, I always felt a bespoke suit made much more of a difference to the way a man looked. No one goes back to ready made suits once they’ve had bespoke; most men continue to buy both bespoke and ready made shoes. The waist and heel treatment of bespoke shoes seemed too minor to be important – something valued only by the obsessives. It seems I was wrong: men are willing to pay hundreds of pounds for those details alone. For many, Tony Gaziano and Dean Girling kickstarted this renaissance in men’s footwear when they set up together five years ago. Their bespoke shoes and bench-made styles were a breath of fresh air in an industry that had produced the same lace-ups in black, brown and tan for decades. Not that Tony and Dean changed the colour of the shoes – it was the style that really stood out. Gaziano & Girling shoes were sculpted, with a more angular look than anything else on the market at the time. They featured a sharp, squared toe, a distinctive pointed toe cap and an angled finish to the waist that was instantly identifiable. The response among shoe fans, particularly on the various internet fora, was rapturous – in part because of Tony and Dean’s individual engagement with these customers. Although they are now stocked everywhere from Johannesburg to Tokyo, San Francisco to Geneva, the pair seem to have managed to retain this personal touch. If imitation is the highest form of flattery, Tony and Dean have been highly praised. But having changed the lens on footwear five years ago, they are determined to do so again. Deco, which launched in January 2011 at Pitti Uomo in Florence, takes their aesthetic one step further. As the photography here hopefully demonstrates, the waist treatment is akin to that of a bespoke shoe – indeed, sharper than a lot of bespoke. The waist is cut close by hand, curving naturally with the shape of the upper to accentuate the sweep right round the shoe. The heel narrows noticeably as it approaches the waist and is pitched ever so slightly, both operations requiring the heel stack to be cut by hand. Running forward, the waist hits a sharp corner before joining the forepart of the sole. This corner, together with the slim waist, creates a ‘spade’ effect that apparently used to be quite widespread on bespoke shoes. It certainly highlights the contrast with the waist. The uppers do their best to compete. More elongated than earlier Gaziano & Girling styles, they somehow manage to make even those angular models look blobby. Black suede and grey alligator mix with the black Deco leather, which is dyed more shallowly than previous skins to produce a luminescent effect. And topping off the look, a slight bleaching to toes here and there to give a grey, antique appearance. Very 1920s. Which is the period that inspired Tony and Dean. “The 1920s was such a great time for men’s clothing. The gentry as a whole was very consistent in its style back then, in the sharp silhouettes and exuberant fashion. We rather took to the look, and tried to resurrect its elegance in the shapes of the Deco line,” says Dean. The shapes and the finish too, were inspired by vintage. “We were looking through old bespoke models and were inspired by the clean lines of the shoes, the elegant waists and slim toes. And the bleaching finish is something that often develops on an old shoe over time. You can see it in the old models in shoemakers’ windows,” says Dean. This effect on the upper is achieved using an alcohol-based cleaner – the same you would use to strip back the surface of an old pair of crust-leather shoes in order to refurbish them. A little of that across the leather bleaches it as the dye in the skin is stripped away. Tony and Dean met at GJ Cleverley, where Tony was designing and selling and Dean was a freelance maker, also working for Foster and Son and John Lobb (where he trained). When Tony went to Edward Green to set up a bespoke business there in 2003, Dean started making shoes for them as well. Tony had worked at Edward Green before joining Cleverley. 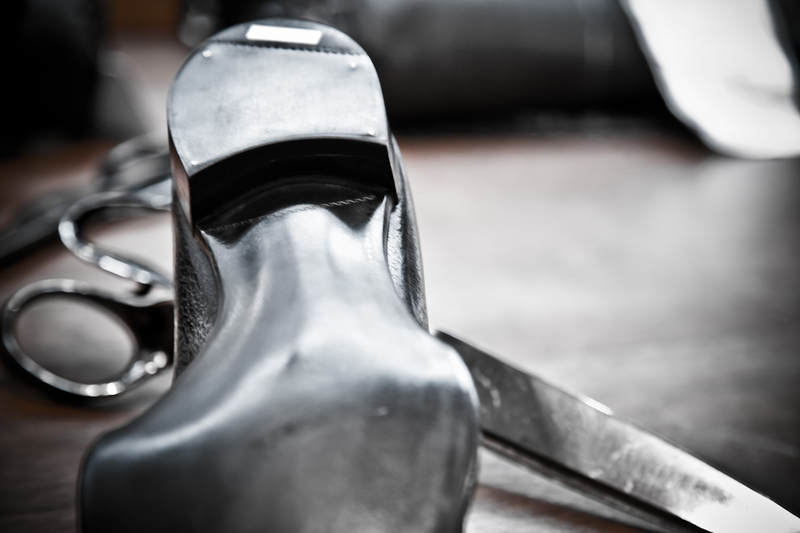 They worked together and slowly began to come up with their own design ideas, with a particular concentration on the fiddle waist – something John Lobb had never done while Dean was there. After three years, Dean convinced Tony to leave and set up together. So in September 2006 they began selling bespoke together, with Dean doing the making and Tony the design (he had originally trained as an architect, where Dean came from a family of shoemakers). The pair did their first show in New York that October. In 2009 they set up their own factory in Kettering, just outside Northampton, to expand ready-to-wear and give them a permanent base. In the past year RTW has really taken off, with some big private label clients, new stockists around the world and new staff joining every few months. It’s not the kind of thing that was meant to happen any more in British manufacturing. Tony and Dean’s shoes are not hard to like. Their joint passion for the design and construction of fine men’s shoes has produced some startling models and spurred an entire industry. But it’s really on a personal level that they inspire, which explains the lasting popularity of their bespoke. Owning a pair of these shoes is one thing, having one made for you quite another. You can follow the discussion on Gaziano & Girling: Deco by entering your email address in the box below. You will then receive an email every time a new comment is added. These will also contain a link to a page where you can stop the alerts, and remove all of your related data from the site. An interesting article but one which has made me think even more regarding ‘bespoke’. This came about from my visit today to Berluti following your recommendation of their over the calf cotton socks. After purchasing two pairs i perused the shoes – and the prices! Taste everyone knows is very individual but how can such shoes in an array of horrendous colours in glistening leather warrant a price tag of £2,800.00? For me the shoes are not elegant, distinguished and sartorial in any aspect and to put it bluntly they are rather bling. My day continued with visits to many shops on both Savile Row, Bond Street and Burlington Arcade, where yet again a new shoe shop has emerged boasting formal expensive black leather shoes with purple rubber soles! Good heavens whatever next! And then finally on the tube home, reading over someone’s shoulder, was an article about how young professional couples are being ousted out of London because its too expensive in all respects. There will always be a divide between the rich and the poor and that is acceptable, however the price of those top end products now have such a premium on them that even after months of saving, one still cant stretch to bespoke shoes! What happened to good old Church’s shoes – after all they are supposed to be one of the best shoe manufacturers in the world aren’t they? And where i am going with this. Well, are people jumping on the ‘bespoke’ band wagon by upping their prices, going over board on the advertising and designing to a nouveau riche public that have, quite frankly, appalling taste? It would seem so to me as i fled from Berluti! Lets hope my socks at least provide me some sense of quality and comfort! Berluti is certainly not to everyone’s taste, but it doesn’t make sense to tar all bespoke with the same brush, given the difference in styles. And the other brand I assume you refer to is Harry’s, which I certainly wouldn’t recommend. Church’s make very good shoes. Generally with English shoemakers you get what you pay for. So £300 or so on Church’s shoes is a lot of money and you get your money’s worth. They will involve more time and effort than Loake or Barker, which are also worth the money, but less than Edward Green or Lobb. Bespoke shoes like Cleverley are also certainly worth the money, despite costing over £2000. Just have a read of my series on the process to see how many days of work go into them. Neither Berluti or Harry’s are bespoke brands. Bespoke is a tiny part of Berluti’s business. So good to talk about those that do bespoke when criticising it. Anonymous, you’d get a lot more pictures if you bought The Rake. Some of Mr Barnham’s finest. Good article, thanks. The question is, in terms of value, what perspective one uses on style (let me try to explain). Church shoes are great. I love them. They are also practical and sturdy the way Florsheim Imperials were in the 1960s. Those were elegant in their own way. But were made for quite reasonable prices and were never intended as “high end” elite fashion. Today they have acquired a cult following. With a Cleverly or G&G, you get outstanding design and craftsmentship, but you get something seriously less practical and for a LOT of money. Alden is closer to what Church does I think. A JOhn Lobb is somewhere in all this, too. Beautiful design, but not really a shoe that is going to last you two decades. Crockett & Jones? I love the 325 last….used on the Pembroke and the Sedbergh. Again…more pratical and conequently to my mind, shoes that will last the test of time a bit better. I’m not sure I necessarily agree. Yes, finer shoes are often less practical. The clue’s in the meaning of ‘fine’. But they are dress shoes and not meant for rough use. If used for dress, there’s no reason at all they couldn’t last 20 years. Out of interest, what do you have against Harry’s? Is it the styling, the quality or just an aversion to rubber soles? I ask because I have recently had to dump my Churches for medical reasons – the doctor says I need something with more support and shock absorption – and I was considering Harry’s as a rather more stylish alternative to the Mephistos he suggested. For the same price you could go get a pair of Crockett and Jones shoes and they would look better, last better and age better. I am biased towards Northampton benchmade shoes, but with good reason.